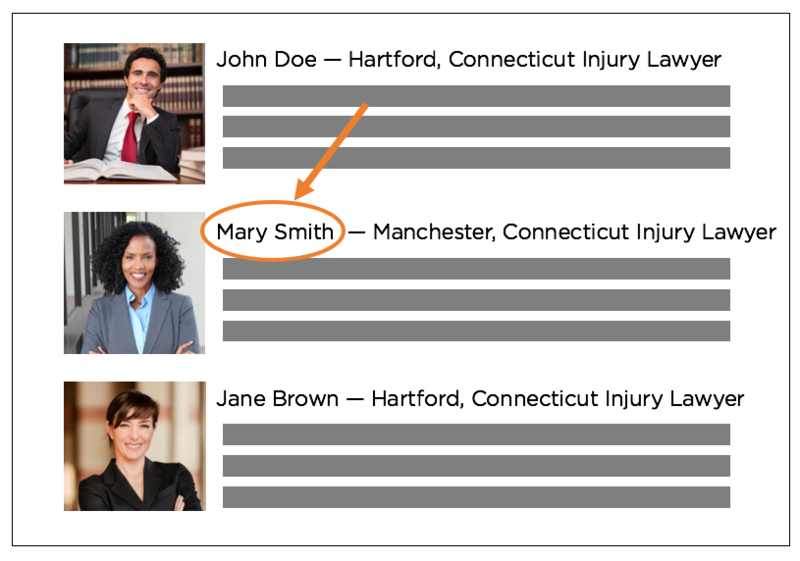 Attorney bios are often an overlooked section of personal injury law firms’ websites. Your attorneys are your practice — with them, you are a firm of trusted, well-intentioned experts with years of experience representing those in desperate need of your help. If that’s the case with your law practice, your website should reflect those values. To rank No. 1 in local search results, especially in competitive markets, you must find natural and honest ways to communicate that you serve a specific community. Some law firms create a page for each city in their service area, making it appear as if they have an office there, even if they don’t. Search engines have become pretty smart — if you think you’re one step ahead of them, the search engines will catch up. Instead, use your attorney bios to show, truthfully, that you have a presence in any relevant communities. If you have an office in Hartford, Connecticut, for example, and you are trying to improve your rankings in Google for “hartford injury lawyer,” make sure that each attorney who works in your Hartford office states that in his or her bio. If one of your attorneys lives in a suburb such as New Britain, you should include that in the bio as well. Many law firms are willing to spend a lot of money in AdWords to rank at the top. Location-specific keywords such as “st louis accident attorney” or “fayetteville social security lawyer” are competitive terms for which other law firms aggressively try to rank. Your attorneys are experts in certain practice areas, so highlight that in their bios. Write something like: “David McDivitt is a personal injury attorney in Colorado Springs.” This truthful statement can indicate to search engines both location and specific practice area. This may be obvious, but it’s worth stating: your attorneys have worked hard to establish a good name for themselves, and that reflects on your law firm. It benefits both your attorneys and your firm to rank well for your attorneys’ names. When someone searches for one of your attorneys, his or her name should show up as the first search result, representing both your attorney and your law firm. Answering questions and telling stories within your attorneys’ bios is a great way to improve your rankings on long-tail keywords. Every one of your cases is unique, but many cases share a common experience. People are looking for someone who can relate to their specific challenges. Ask each attorney about a victory that he or she is proud of, and tell those stories in their bios. Additionally, find out your attorneys’ frequently asked questions, and answer those in the bios as well. For example, potential clients might ask: “Can a personal injury attorney really help me deal with the insurance company?” Tell a story to answer the question, and your rankings will improve. There are many creative ways to execute good and ethical SEO on your law firm’s website — but many of these strategies take a lot of planning and time. Save your resources by simply telling your attorneys’ stories! More potential clients will find your website, and they’ll appreciate the authentic story-telling through your attorneys’ bios. Don’t forget: Good marketing means writing for people first, not the search engines! It also means writing ethically: click here to check out our post on the blogging practice that kills law firms. Interested in improving your law firm’s marketing even more? Request a complimentary digital audit of your website (click here) — delivered to your inbox in two business days.